Gallstones: Stones that form when substances in the bile harden. Gallstones can be as small as a grain of sand or as large as a golf ball. There can be just one large stone, hundreds of tiny stones, or any combination. Gallstones can block the normal flow of bile if they lodge in any of the ducts that carry bile from the liver to the small intestine. That includes the hepatic ducts, which carry bile out of the liver; the cystic duct, which takes bile to and from the gallbladder; and the common bile duct, which takes bile from the cystic and hepatic ducts to the small intestine. Bile trapped in these ducts can cause inflammation in the gallbladder, the ducts, or, rarely, the liver. Other ducts open into the common bile duct, including the pancreatic duct, which carries digestive enzymes out of the pancreas. 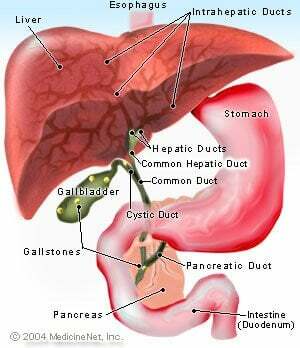 If a gallstone blocks the opening to that duct, digestive enzymes can become trapped in the pancreas and cause an extremely painful inflammation called gallstone pancreatitis. If any of these ducts remain blocked for a significant period of time, severe damage or infections can occur, affecting the gallbladder, liver, or pancreas. Gallstone attacks often occur after eating a meal, especially a fatty one. Symptoms can include pain for up to several hours in the upper, back, or under the right shoulder together with nausea, vomiting, abdominal bloating or indigestion. These symptoms can mimic those of other problems, including heart attack, so accurate diagnosis is important. There are two types of gallstones -- cholesterol stones and pigment stones. Cholesterol stones account for about 80 percent of gallstones in N. America and Europe. Pigment stones have a high content of bilirubin (a colored pigment) and account for over 90 percent of gallstones in Asia. Gallstones are more common among women, Native Americans, Mexican Americans, and people who are overweight. Laparoscopic surgery to remove the gallbladder is the most common treatment. The surgery is called cholecystectomy. Open surgery is done if there are obstacles to laparoscopy. The gallbladder is a dispensable organ. Without it, the bile flows directly into the small intestine, instead of being stored in the gallbladder.